With a victory over Wilson Reis in the main event last Saturday, Demetrious Johnson tied Anderson Silva’s record for most consecutive UFC title defenses. Many pundits have been quick to decry the accomplishment due to the current state of the flyweight division. The UFC did not crown their first flyweight champion until 2012, and the division has been in the developing stages ever since. With that being said, Johnson has been nothing short of dominant. 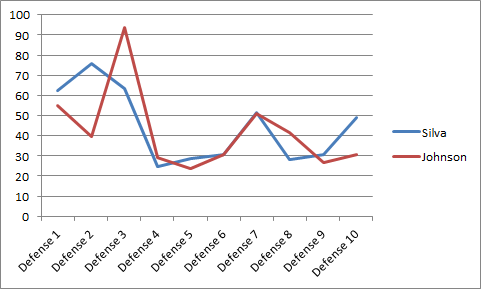 How do the two strings of title defenses compare? In terms of ranking points alone, Silva faced a much tougher road than Johnson. 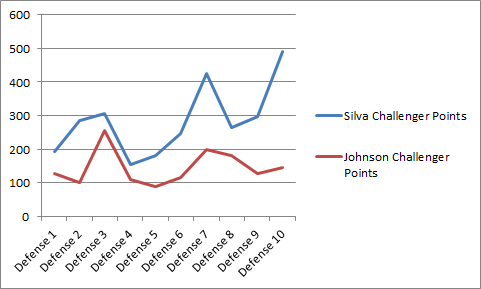 As you can see in the following chart, Silva’s opponents almost always had more ranking points. However, that does not tell the entire story. Fighters competing in more developed divisions will obviously have more points. Ranking points are the result of the Fight Matrix statistical model. The more points a fighter has, the higher the fighter is ranked. You can find more information here. In terms of ranking points difference, Silva seems to have faced much more overmatched opponents. After his first three title defenses, he had at least a 400 point advantage in all of his successful title defenses. The proportional difference is champion’s ranking points divided by the challenger’s. The higher the number the closer or more even the bout. 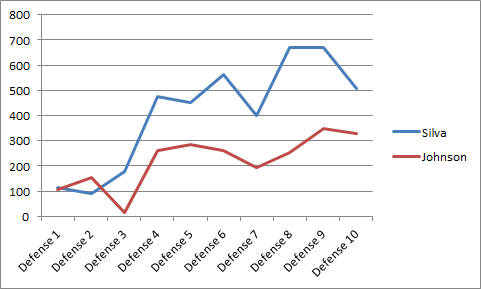 As you can see from the following chart, the path of both champions is remarkably similar. Plus, Johnson’s third title defense against Joseph Benavidez is the toughest challenge that either fighter faced during the run. Johnson’s run of title defenses might not be on the level of Silva’s, but it is certainly worthy of respect. Plus, there does not appear to be a challenger who could unseat the champion on the horizon.